Last night I thought my heart was going to burst with pride. 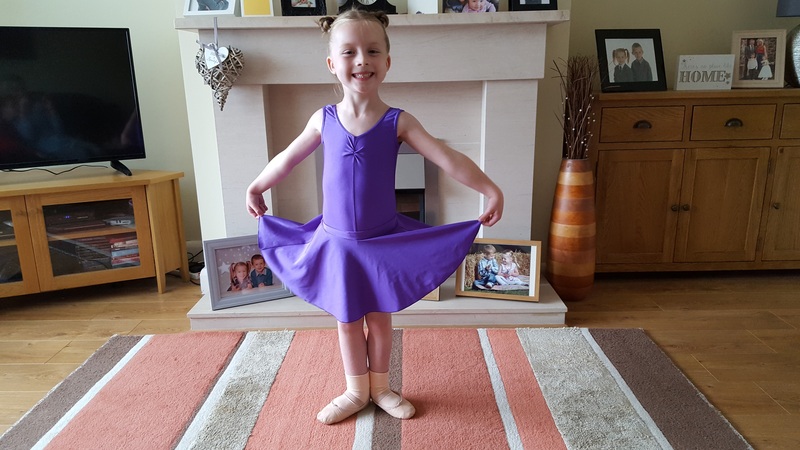 The dance school that Lucia attends was holding its Annual Show and her class – the babies class – was doing a little part to show all the parents, grandparents and aunts and uncles some of the ballet moves they have been learning over the last year. Lucia had been so so excited all week and counting down the sleeps until the show, so come Thursday she was beside herself! After an early tea (that was eaten by both Max and Lucia in record time!) we started to get her dressed into her ballet clothes for the show – a purple leotard, purple skirt and ballet shoes with a pair of peach socks. As you can imagine the whole socks issue had been playing on my mind a bit as Lucia always wears her compression garments to ballet. Her lovely teacher had suggested she wore her skin coloured tights with the socks over the top, but this wouldn’t have worked because we would never have been able to get her ballet shoes on. So we decided to let her just wear the socks. It was an evening performance, she had worn her garments all day, it was only for a short period of time and Lucia wanted to be just the same as all her fellow ballerinas. When we told her she could wear the socks without her tights she actually squealed with delight. She ran up and down the house shouting ‘no tights no tights’ and told me I was the best mummy in the world as she squeezed me in a huge hug. And when I got her all dressed she actually said, ‘it’s so lovely to have my legs out!’ as she twirled and skipped about. It is little moments like this that make my heart happy and sad at the same time – how something so completely normal and insignificant to anyone else can mean absolutely everything to our little girl. I then got the all important hair sorted with a ton of mousse, clips and hairspray and we were good to go! The show was being held in the local Town Hall and when we arrived Lucia was so excited to see the stage and couldn’t wait to get on and do her bit! But she had to wait! We watched lots of the older dancers doing their pieces first and Lucia couldn’t take her eyes off them – but between each act kept asking is it my turn now, how much longer, how many more…until finally, it was the babies turn. Watching her run onto that stage on her tip toes with a beaming smile on her face had me fit to burst with pride and tears! Our girl was so happy. When I think back to all of the uncertainty when she was a baby – not knowing if she would be able to walk never mind run or dance – and now we were watching her dancing on a stage! She pointed her toes, she jumped, she plied, she skipped and was the most beautiful, joyful ballerina ever. And we were all the proudest mummy, daddy, brother, grandparents, aunt and uncle ever! When she came off stage we couldn’t wait to cuddle her and Max said she was the best ballerina he had ever seen (best big brother ever!). After it was all over and the adrenalin wore off she was completely exhausted and was asleep in seconds when we got home. This morning she was still extremely tired – but thankfully it’s Friday so she only had one day of school to go and she couldn’t wait to tell her teachers all about her night! When I collected her from school her assistant told me that Lucia had been too tired to do PE so she just sat and watched her class as they practised for Sports Day. Although she was only on stage for about 10 minutes, the whole experience clearly took a lot out of her and it is wonderful that the school take on board how she is feeling. Now for a quiet few days to help her recover, though we have a very important football match to watch first starring Max – super proud mummy alert once again!